Having grown up on the Gulf coast of Alabama, I’m very fond of seafood, to say the least. Whenever I go home for a visit, I eat it non-stop, boiled, sautéed and fried-you name it. So I was so happy to find frozen shrimp at my local grocery store caught down in good ole Bayou La Batre. 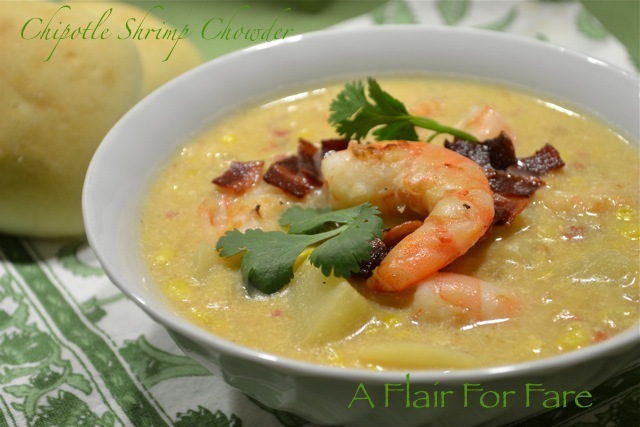 I had recently made gumbo, so I started the search for something different. A while back I tried the Smokey Corn Chowder recipe that I had pinned from “Bev Cooks” and it was awesome. Her recipe is just for two, which worked out great. This dish was a big hit but it occurred to me that potatoes would be a good addition, giving the chowder a hearty, thicker base. Today I’d like leftovers, so between the two recipes I made some adjustments and created my own version. I haven’t been successful in finding smoked paprika in the grocery store so in searching for a substitute I decided on Chipotle peppers in adobo. 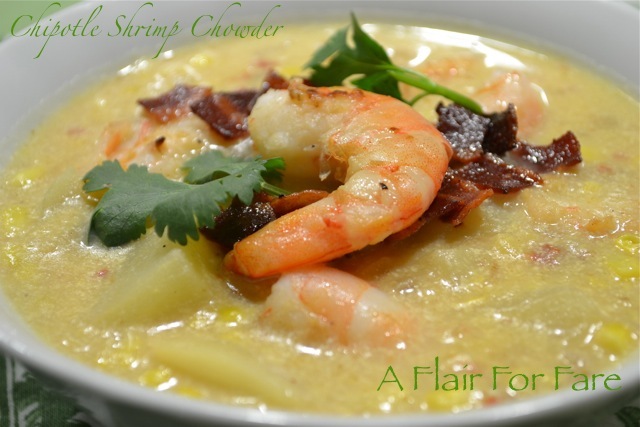 I love it’s intensely smoky flavor and it gave my chowder just the right amount of kick. 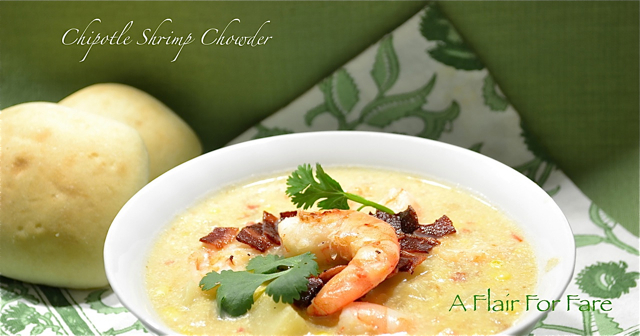 This recipe makes 4 main course portions or 6 first course portions. Heat a large dutch oven or soup pot over medium heat. Add the bacon and sauté until crisp. Remove and drain on a paper towel. Pour off all but 2 tablespoons of the drippings. Add shrimp and cook just until no longer pink (do not overcook). Remove shrimp. Add onions and sauté until translucent. Add the garlic and sauté for just a minute being careful not to burn. Turn up the heat and add the corn, potatoes and chipotle pepper and adobo, broth and half and half and bring to a simmer. Continue to simmer for 15- 20 minutes until the potatoes are tender. Don’t be alarmed if the half and half appears to be curdled. Transfer 2 cups of the chowder to a blender. Puree just until you get a smooth, thick consistency. Return to pot and add salt and pepper to taste. Add cut shrimp just before serving. 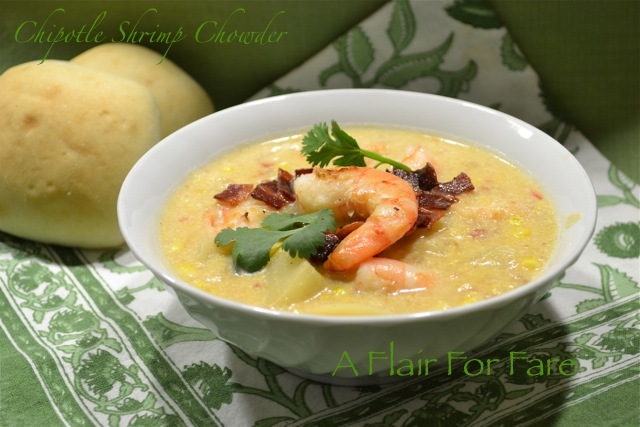 Serve in soup bowls and garnish each with the bacon and a whole shrimp and cilantro.